This is an odd film noir movie. 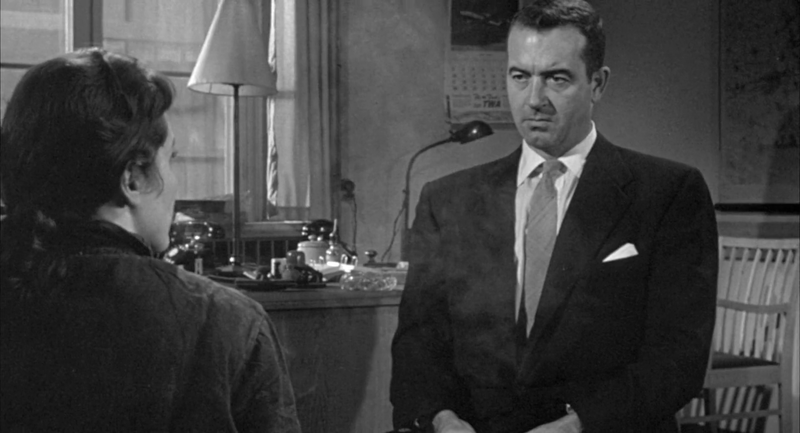 John Payne&#39;s career had changed with the times. 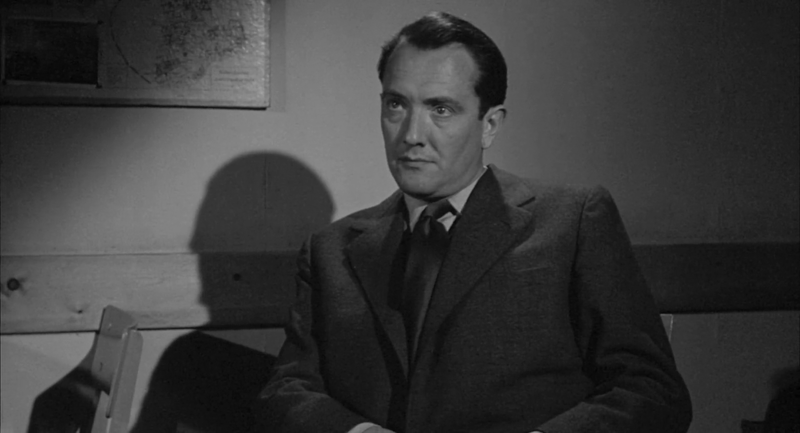 Now middle-aged, he stopped playing pretty boys and acted in some very dark films like &quot;Kansas City Confidential&quot;, &quot;99 River Street&quot; as well as &quot;Hidden Fear&quot;. But, in an odd twist, &quot;Hidden Fear&quot; is set in Denmark! 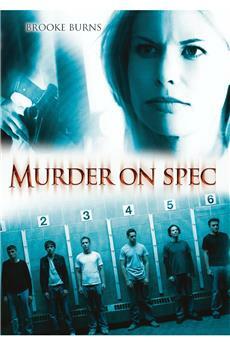 The film begins with Payne&#39;s sister being arrested for murder. Naturally she says she didn&#39;t do it and since Payne is a cop back in the States, he starts digging around to see what really occurred. His trail soon leads him to some counterfeiters. 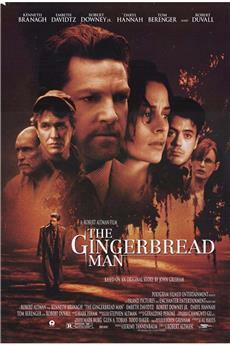 Payne plays a violent and tough guy--and this is the best aspect of the film. As for the plot, it&#39;s just okay--and a bit talky at times. Worth seeing but not at all a distinguished film.<br/><br/>By the way, when Payne discovers some fake $100 bills, he describes them as &#39;Alexander Hamiltons&#39;. Hamilton is on the American $10 bill and Ben Franklin is on the $100 (even back in the 50s). Also, get a load of that carousel in the bar near the end of the film! 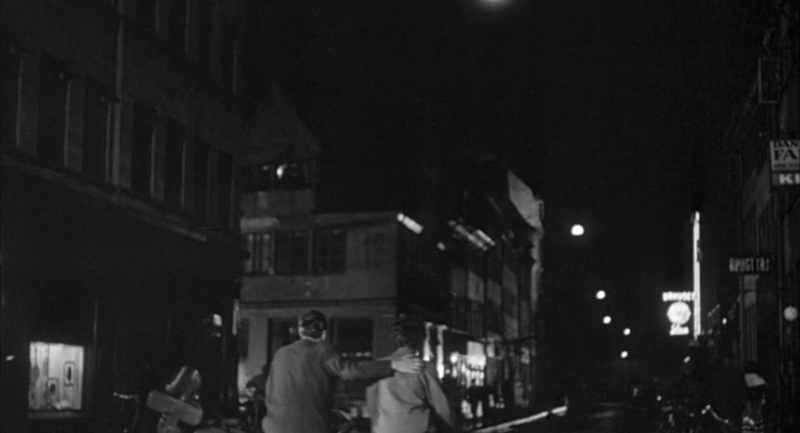 Filmed in Copenhagen, &quot;Hidden Fear&quot; is a 1957 film starring John Payne, Conrad Nagel, and Alexander Knox. 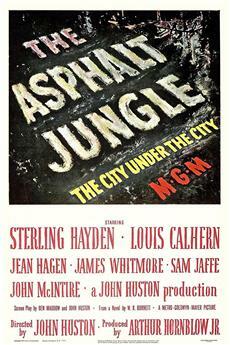 It was directed by Andre de Toth, who had seen better days.<br/><br/>Payne loved playing tough guys and did a few of this type of film. This was his last before going into television work.<br/><br/>He plays Mike Brent, who comes to Copenhagen because his sister is in prison for murdering her boyfriend Tony Martinelli. She swears she didn&#39;t do it.<br/><br/>In trying to find the killer, Mike stumbles across a counterfeit currency ring. I was a little confused as to where this money ended up. I also don&#39;t actually know who killed Martinelli. We do know they were looking for something as Mike&#39;s hotel room and Martinelli&#39;s apartment were both trashed.<br/><br/>There was a lot of punching and knocking people over the head - I&#39;m surprised no one wound up with brain damage.<br/><br/>It&#39;s sad in a way to see people in this who were former stars in other eras - Nagel way back in the &#39;20s and early &#39;30s, Payne, of course, and Knox who wasn&#39;t a huge star but played leads in films. I suppose back then it was a natural progression, particularly in the case of Knox and Nagel, to turn to character roles. Nowadays it seems as though male stars stay on top longer.<br/><br/>Really didn&#39;t care for it and there&#39;s some poetry or some sort of recitation at the end that seemed out of place. 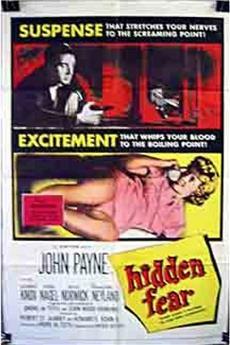 Before deciding that television was a good career move and leaving feature films, John Payne did this last one Hidden Fear for which he got a trip to Copenhagen. I&#39;ve heard of worse reasons for a movie and worse films that came from them. Hidden Fear will never be ranked in his top 10 nor of the top ten of Andre DeToth the director.<br/><br/>Payne plays a homicide cop who&#39;s in Copenhagen because his sister Natalie Norwick&#39;s got herself in a nice jackpot with the Danish police. She&#39;s accused of murdering her boyfriend who was a dancer/musician and something of a lowlife. Payne starts running his own investigation and it turns out that the boyfriend was trying to horn in on a counterfeiting scheme that Alexander Knox and Conrad Nagel are running.<br/><br/>Truth be told Payne&#39;s truculent attitude probably cut a few corners, but the Danish cops probably were well on the way toward learning the truth. 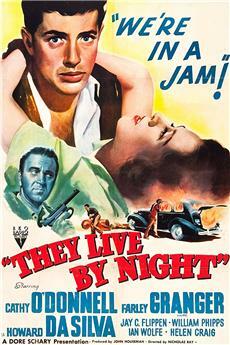 For that reason I can&#39;t really rate this noir film very high. In fact it could have gotten another notch in the ratings had we some color cinematography of Copenhagen and the Danish countryside.<br/><br/>These kind of films were disappearing and Payne probably made a right choice when he left feature films.